Complete Guide to Special Teams is the authoritative resource on the kicking game for coaches and players. Created by the American Football Coaches Association, this guide could spell the difference in the outcome of several games each season. In addition, this comprehensive guide presents detailed technique instruction for kickers, punters, long snappers, field goal and extra point kickers and holders, kickoff and punt returners, and other specialized positions related to the kicking game. 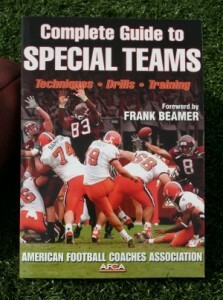 Chapters on the development of special team units and players highlight the best practice drills and key teaching points for success.